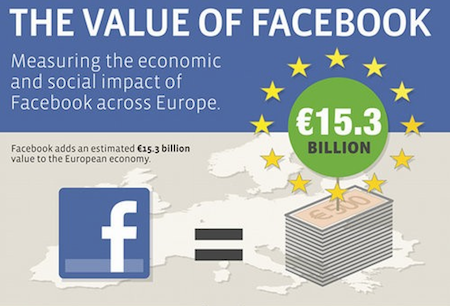 The Value of Facebook measuring the economic and social impact of Facebook across europe, Facebook adds have a £billions of pound value in only europe. Today we showcase you value of Facebook infographic which tells you how much jobs supported by Facebook activities and platform in united kingdom, france, germany, spain, italy, ireland. How many jobs supported by facebook in europe. The total value of facebook is 15.3 billion pound across europe, Business participation effects using facebook to promote their brand and generate new business. have a look to this facebook value.